James Harris Gallery | Tony Feher, "Two Works"
The James Harris Gallery is pleased to present an exhibition of work by Tony Feher. Much admired and widely considered to be one of the important contemporary American sculptors, Feher has refined his post minimalist aesthetic over the duration of a career spanning over 25 years. The artist uses everyday objects and found materials revealing a richness and complexity in what most would consider the mundane. Self-described as an archaeologist of his own life, Feher collects objects and materials taken from everyday life. He then uses these pieces, often fragile and temporary, in cohesion to exploit and accentuate their form, color and texture. His work is a statement on the duality of life and the ability to overcome. Feher states, “Life is vulnerable, not fragile. Life perseveres. It has a tenacious grip. My art may appear fragile, but it holds on.” He has spent his career creating works that aim to celebrate creativity by reducing his work to the most minimal point. Feher ignores the hierarchical norms held against material; he selects objects that are originally intended for singular use or disposal and bestows them with new purpose and an elongated lifespan. This exhibition will feature two important works by Tony Feher. 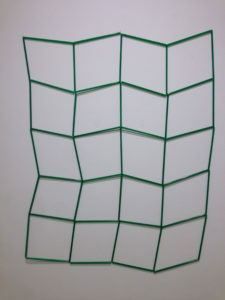 One consists of plastic straws and polyester thread constructed in a grid formation and hung against the wall of the gallery. Feher’s pure lines and geometric architecture of space speaks to his minimalistic legacy. 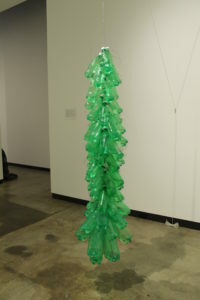 The second work, “Green Window” is created from green plastic bottles with plastic caps, chain, wire, water and rope. This will be suspended from the ceiling in a downward spiraling cluster. These works encompass the dueling natures of Feher’s work; one shows a more fluid and organic shape while the other adheres to a rectilinear formation. Despite their contrasting abstractions, both uniquely engage the spaces they inhabit. A twenty-five year retrospective of Feher’s work is currently on view at the Akron Art Museum. This exhibition has traveled the United States for over two years. A 264 page catalogue accompanies the exhibition. His work is featured in prominent public collections such as the Whitney Museum of American Art, the Solomon R. Guggenheim Museum, the San Francisco Museum of Modern Art, The Art Institute of Chicago, Hammer Museum, Los Angeles and the Dallas Museum of Art. 37" x 30" x 1/4"